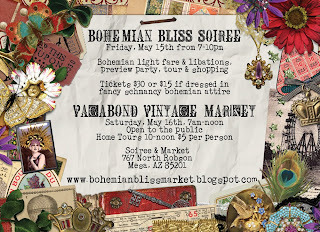 I am so excited about this upcoming event in Mesa I can hardly stand it. It's sponsored by the fun people who own Domestic Bliss on Mains St. in Mesa. Please come!! I'll be there with lots of great funky art!! Let me know if you want tickets and I'll get some for you. Here are some fun smaller pieces I recently painted with the peace, love, joy theme on them. Yes, they have beaded fringe hanging from the bottom, couldn't resist! Just found out today I'll be going to Boulder, Colorado for an Art Festival on July 25 and 26th. Yippeee. I'll probably be doing more shows in Colorado in July as well. Why not?? Wow, what a fantastic 3 months -but I am glad it's over. Since Expo I've been working on commissions and catching up with my life that seemed to dissapear for 74 days. I just got back from an Art Festival in Boulder City, Nevada just outside Vegas 6 miles from Lake Mead. Love that town, it's awesome, go - hang out in the historic downtown area!! One of my paintings won best in show - the Saguaro triptick AND I sold the painting as well. I also sold a bunch of earings and prints along with another large metal animal. It was so much fun!